Type: TITLE and FOOTNOTE are global statements. NOTE is a local statement. specifies the color for the following text, box, or line. specifies the font for the subsequent text. specifies the height of text characters in number of units. 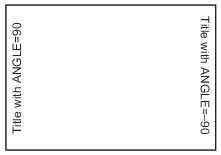 specifies the angle of the baseline of the entire text string with respect to the horizontal. specifies the angle of the entire text-string(s). specifies the angle at which each character of text is rotated. protects the box and its contents from being overwritten by any subsequent graphics elements. draws a box around one line of text. specifies the amount of space between the boxed text and the box. draws lines anywhere on the graphics output area. specifies a uniform resource locator (URL) to which a title or footnote links. specifies the alignment of the text string. specifies the amount of spacing above and below lines of text. wraps the text to a second line if the text does not fit on one line. is an element of text-argument(s) and specifies one or more strings up to 200 characters. Any of the following text-options that are used to modify a text-string must precede text-string. Angled titles or footnotes might require more vertical space. Consequently, there might be an increase the size of the title area or the footnote area, thereby reducing the vertical space in the procedure output area. Positioning Titles with the ANGLE= Option shows how ANGLE=90 degrees or ANGLE=–90 degrees positions and rotates title text. ANGLE=90 positions the title at the left edge of the graphics output area, angled 90 degrees (counterclockwise) and centered vertically. ANGLE=–90 positions the title at the right edge of the graphics output area, angled –90 degrees (clockwise) and centered vertically. Positioning Footnotes with the ANGLE=Option shows how ANGLE=90 degrees or ANGLE=–90 degrees positions and rotates footnote text. ANGLE=90 positions the footnote at the right edge of the graphics output area, angled 90 degrees (counterclockwise) and centered vertically. ANGLE=–90 positions the footnote at the left edge of the graphics output area, angled –90 (clockwise) and centered vertically. Positioning Notes with the ANGLE= Optionshows how ANGLE= 90 degrees or -90 degrees positions and rotates note text. ANGLE=90 positions the note at the bottom of the left edge of the graphics output area, angled 90 degrees (counterclockwise) and reading from bottom to top. ANGLE=–90 positions the note at the top of the right edge of the graphics output area, angled –90 (clockwise) and reading from top to bottom. 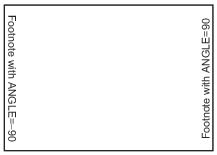 specifies the background color of a box produced by the BOX= option. By default, the background color of the box is the same as the background color for the entire graph. The color of the frame of the box is determined by the color specification used in BOX=. Restriction: If you omit BOX=, BCOLOR= is ignored. Note:The BCOLOR= option can be reset by the ANGLE= or JUSTIFY= options, or by the MOVE= option with absolute coordinates. protects the box and its contents from being overwritten by any subsequent graphics elements. It does this by blanking out the area where the box is displayed. The BLANK= option enables you to overlay graphics elements with boxed text. It is ignored if you omit the BOX= option. 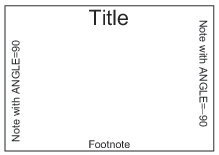 Because titles and footnotes are written from the highest numbered to the lowest numbered, the BLANK= option only blanks out titles and footnotes of a lower number. Note:The BLANK= option can be reset by the ANGLE= or JUSTIFY= options, or by the MOVE= option with absolute coordinates. You can include more than one text string in the box as long as no text break occurs between the strings. That is, you cannot use the JUSTIFY= option to create multiple lines of text within a box. The MOVE=option on this NOTE statement overrides the JUSTIFY= option that center-positioned the first line of text. The MOVE= option specifies the x and y coordinates in percentage units. 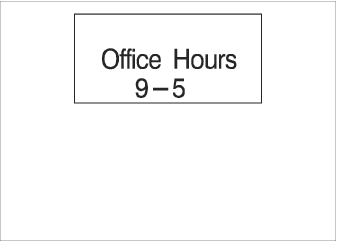 The text string ‘9–5’ is positioned relative to the first text string ‘Office Hours’. Note:The BOX= option can be reset by the ANGLE= or JUSTIFY= options, or by the MOVE= options with absolute coordinates. specifies the amount of space between the boxed text and the box. The space above the text is measured from the font maximum, and the space below the text is measured from the font minimum. By default, BSPACE=1. Note:The BSPACE= option can be reset by the ANGLE= or JUSTIFY= options, or by the MOVE= option with absolute coordinates. The coordinate position (0,0) is the lower left corner of the graphics output area. Specify at least two coordinate pairs. Commas between coordinates are optional; blanks can be used instead. The DRAW= option does not affect the positioning of text. Notes:Font names greater than eight characters in length must be enclosed in quotation marks. If the TITLE or FOOTNOTE is being output through an ODS markup destination and the corresponding NOGTITLE or NOGFOOTNOTE option is specified, then the bold and italic FONT attributes are on by default. However, if you specify different attributes with the FONT= option, the bold and italic attributes are turned off. Note:The Java applet and ActiveX control enable you to control the relative height of text with the HEIGHT= option, but not the absolute height in terms of specific units. Note:Using the JUSTIFY= option after one text string and before another can reset some options to their default values. specifies the angle of the baseline of the entire text string(s) with respect to the horizontal A positive value for degrees moves the baseline counterclockwise; a negative value moves it clockwise. By default, LANGLE=0 (horizontal). Positioning Titles with the LANGLE= Option shows how LANGLE=90 degrees and LANGLE=–90 degrees positions and rotates titles. LANGLE=90 angles the title 90 degrees (counterclockwise) so that it reads from bottom to top. The title is centered horizontally and positioned at the top of the picture. LANGLE=-90 angles the title –90 degrees (clockwise) so that it reads from top to bottom. The title is centered horizontally and positioned at the top of the picture. Positioning Footnotes with the LANGLE= Option shows how LANGLE=90 degrees and LANGLE=–90 degrees positions and rotates footnotes. LANGLE=90 angles the footnote 90 degrees (counterclockwise) so that it reads from bottom to top. The footnote is centered horizontally and positioned as the bottom of the picture. LANGLE=–90 angles the footnote –90 degrees (clockwise) so that it reads from top to bottom. The footnote is centered horizontally and positioned at the bottom of the picture. Positioning Notes with the LANGLE= Option shows how LANGLE=90 degrees and LANGLE=–90 degrees positions and rotates notes. LANGLE=90 positions the note at the top of the left edge of the procedure output area, angled 90 degrees (counterclockwise) so that it reads from bottom to top. LANGLE=–90 positions the note at the top of the left edge of the procedure output area, angled –90 degrees (clockwise) so that it reads from top to bottom. specifies a uniform resource locator (URL) to which a title or footnote links. The text-string that you use to specify the URL can contain occurrences of the variables #BYVAL, #BYVAR, and #BYLINE, as described in text-string(s). Note:If the title or footnote is being output through an ODS markup destination (such as HTML) and the corresponding ODS option NOGTITLE or NOGFOOTNOTE is specified, then the title or footnote is rendered in the body of the HTML file rather than in the graphic itself. Specifying the NOGTITLE or NOGFOOTNOTE options results in increasing the amount of space allowed for the procedure output area, which can result in increasing the size of the graph. Space that would have been used for the title or footnote is devoted instead to the graph. You might need to be aware of this possible difference if you are using annotate or map coordinates. Note:The LSPACE= option can be reset by the ANGLE= or JUSTIFY= option, or by the MOVE= option with absolute coordinates. The starting point for lines specified with relative coordinates is at the end of the most recently drawn text or line in the current statement. If no text or line has been drawn in the current statement, a warning is issued in the SAS log. The relative move is measured from where a zero-length text string would have ended, given the normal placement for the statement. You can mix relative and absolute coordinates. Notes:If you specify the MOVE= option with at least one absolute coordinate and if the option follows one text string and precedes another, some options can be reset to their default values. If you specify the GUNIT graphics option, then that unit is the default unit. If you do not specify the GUNIT= graphics option, then the default unit is CELLS. is an element of text-argument(s) and specifies one or more strings up to 200 characters. Any of the following text-options that are used to modify a text-string must precede text-string. You must enclose text strings in single or double quotation marks. The text appears exactly as you type it in the statement, including uppercase and lowercase characters and blanks. substitutes the entire BY line without leading or trailing blanks for #BYLINE in the text string. It also displays the BY line in the footnote, note, or title produced by the statement. Restriction:#BYVAL or #BYVAR substitution in a text string is not available in the DATA Step Graphics Interface or in the Annotate facility. The reason is that BY lines are not created in a DATA step. Underlines follow the text baseline. If you use an LANGLE= or ANGLE= option for the line of text, the underline is drawn at the same angle as the text. Underlines do not break up to follow rotated characters. Notes:The UNDERLIN= option can be reset by the ANGLE= or JUSTIFY= option, or by the MOVE= option with absolute coordinates. See Using Options That Can Reset Other Options for details. The Java applet and ActiveX control underline text when the UNDERLIN= option is specified, but they do not vary the thickness of the line. Restriction:The WRAP option does not work with the BOX, BLANK, UNDERLINE, and MOVE options. You can use as many text strings and options as you want, but place the options before the text strings that they modify. See Using Multiple Options. The most recently specified TITLE or FOOTNOTE statement of any number completely replaces any other TITLE or FOOTNOTE statement of that number. In addition, it cancels all TITLE or FOOTNOTE statements of a higher number. For example, if you define TITLE1, TITLE2, and TITLE3, then resubmitting the TITLE2 statement cancels TITLE3. MOVE=(x,y) <units> positions a line or lines of text anywhere on the graphics output area using x and y as absolute or relative coordinates. See the description of each option for usage details and restrictions. If in a TITLE, FOOTNOTE, or NOTE statement, before the first text string, you use an option that can be reset (such as the UNDERLIN= option) and before the second string, you use an option that resets it (such as the JUSTIFY= option), the first option does not affect the second string. In order for the first option to affect the second string, repeat the option and position it after the resetting option and before the text string.